The recent federal court assaults on voter ID laws in Texas, North Carolina, North Dakota, and Wisconsin have guaranteed that November’s elections will be rife with fraud; but depending on the level of citizen involvement, there now remain only two plausible outcomes this year. Scenario 1, Donald Trump will cruise into election day with something like a 52-43 percent lead; but he will lose in an Iranian style “landslide” and Hillary Clinton is declared the winner by decisive 5%. The news will report widespread chaos at numerous voting locations and corrupt judges will order certain precincts in heavy minority districts to remain open late Into the night . Outraged cries of voter fraud will easily be tamped down by the media, but the unrest will grow as nothing is done about the complaints. Under this dark narrative, America slides into a one-party dictatorship for at least a generation and we finally get that wall around our border…to keep people from escaping. Scenario 2 will involve thousands of volunteer election monitors who recognized the danger and pull up their sleeves to make sure vote fraud can’t change the will of the majority. In this scenario, Trump squeezes out a two or three percent win and news accounts will feature stories about people who are caught in the process of attempting to steal extra votes. The left will scream about voter suppression, but the public will be more concerned with the widespread reports of criminal enterprise-level voter fraud, broken up by law enforcement groups working with help of civilian volunteers. Recent partisan judicial tyranny seems designed to increase the likelihood of scenario one, but honest elections are still possible…if our elected “leaders” have any courage…and if those angered by the theft of our voter ID laws will do more than gripe. 1) Data Merging: There still remains a very subtle way for any state’s governor to enable a soft voter ID program with provisions designed into it that would discourage people from voting more than once. Under this system virtually all voters’ identities would be confirmed without their knowledge or concern. This could easily be accomplished by merging certain data, already owned by two agencies, usually under the governor’s control: DMV and Board of Elections. States with a Secretary of State in charge of elections may require enabling legislation, but not in NC. The process begins by matching the voter rolls with all facial imagery owned by the DMV. an even better practice would be to include facial imagery from other state agencies, like law enforcement and social services. 2) Redesigned Polling Books: Next, election officials combine the records into their polling books, both electronic and paper. When a voter shows up to vote, the employees will have a general idea of what the person looks like. Warning: Since we’ve already proven that some election employees will cheat while conducting Elections, two people would need to verify the visual image of each person attempting to vote; but as long as they both agree the person trying to vote matches the face on the record, the person gets a ballot…with no further questions. 3) Adjudicating the Mismatches: Of course the scenario gets dicey when the image does not match. This is where political courage will affect the outcome. Some cases will be administrative error. Others will not. On Election Day, all such voters would need to cast a provisional ballot, but they would also be asked to provide either a picture ID card and a thumbprint. Before anybody screams about civil rights, let’s remember that as we already go through that process when trying to cash a check at an unfamiliar bank. 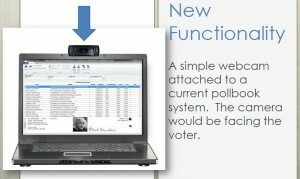 During early voting, officials could avoid the finger print by adding a $30 web camera to their electronic polling book and just snap the voters picture, on the spot. This capability was already recommended to the NC Joint Legislative Committee on Elections (see pages 38-49). 4) Preventing Vote Fraud: Under this plan, no voters would be disenfranchised, but the individuals who are regularly paid during each election to steal extra votes would realize they have a greater chance of being prosecuted for their crime. 5) Transparency: One more essential component of this strategy is that the redacted name, address and facial image of any voter not matching their identity would also be a matter of public record. The transparency of this process is critical. Otherwise, public trust will still not be restored. Besides, election employees have been proven to be just as human as the rest of us. Far beyond the naivete of trusting “the government” to ensure our elections are open and honest, an awaken public must recognize that honest elections depend on each citizen doing their job… and on Election Day, part of that job involves making sure people are not committing vote fraud. Equally important, the enabling executive order (or legislation) would need to mention the uploading of thumbprints into a law-enforcement grade matching system; with election and law enforcement officials accepting their responsibility to aggressively prosecute those who are caught trying to steal elections. In conclusion, America now stands at the last exit ramp on the highway toward totalitarian dictatorship. Either we can regain control of our electoral process, or we can stand around after the election has been stolen and complain that it wasn’t fair… as the tanks roll over anybody who complains too loudly.